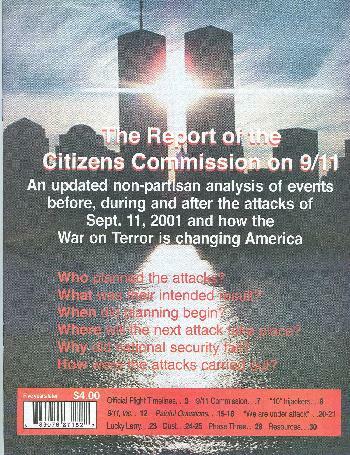 Order The Report of the Citizens Commission on 9/11 online with PayPal here. And the forehorse of this frightful team is public debt. Taxation follows that, and in its train wretchedness and oppression. We live in the greatest nation in the world today. We also live in the greatest nation the world has ever seen. We are not, however, immune from the socio-political clock which has ticked away at every nation before us since groups of people formed their first governments. According to the ol' socio-political clock on the wall--it's later than most of us think. The greatest, most learned and sincerely dedicated men in recent western history, our Founding Fathers, gave us a Constitutional Republic. 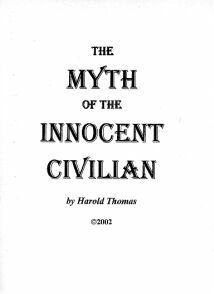 They painstakingly designed a form of government which had the sole function of preserving and protecting the inalienable rights of all men to pursue life, liberty and happiness. Those great men, the ones we owe our country to, knew that the tendency of all governments is to view people as a human resource and develop "legal" means to exploit them. That is why they gave us a government of, by and for the people and left us detailed instructions on how to maintain our freedom and preserve our God-given right to life, liberty and happiness. 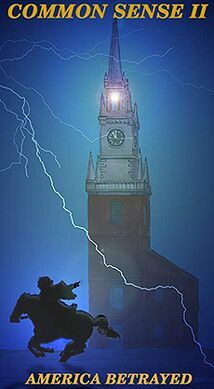 Our Founding Fathers told us that the price of liberty is eternal vigilance. Though they told us that over 200 years ago, I see no seams in that logic--it was just as true then as it was 200 years before they told us and it is just as true today. Our government of, by and for the people is completely worthless unless the people part of the equation watches government like a hawk to see that it doesn't begin voting itself money from our treasury and taking us citizens for granted as a human resource. We are not human resources. We are human beings endowed by our Creator with certain inalienable rights, that among these are life, liberty and the pursuit of happiness. One of our other rights is to expose the people who have chosen to view us as human resources and hold them accountable for the attempted plunder of our lives under their threat to steal our freedom if we do not comply. In several years of investigative journalism, one lesson has been learned that transcends all others: The only way to penetrate the wall of corruption and government intrusion which is taking a sledge hammer to the very foundation from which our country was built is exposure--social control. It isn't laws and prisons and rules and regulations, it isn't more and bigger government, it is decent people setting the example and holding indecent people accountable for their actions. Public exposure to the indecent, illegal and immoral activities of people, particularly those who have decided to take 50 percent of our wages in taxes, is the job of a free press. Judging by the way unethical and immoral people have taken the reins of our country and driven her over a cliff, the "free" press has not done its job very well. A free press is the only thing that works. If you want your country back, support your free press. Write to it, advertise in it, subscribe to it and spread the truth around. We can no longer take our country and the freedoms we've been told we have for granted, because in many ways, some subtle, some painfully obvious, they are gone. We have to reread the instruction manuals the Founders of this great country left us and follow them if we plan to earn our freedoms back. The editors, supporters and contributors who make The Idaho Observer possible are all deeply concerned about the future of our country. All hope for the future rests somewhere between the activities of good people who have identified things which are broken and are dedicating their lives to finding solutions to them and viable new technologies which will enhance the human experience on this planet while allowing us to maintain a safe and clean environment within which to live. Between the actions of good people and viable new technologies stands a wall of corruption and greed and immorality so thick it boggles the mind. Every avenue and facet of our culture that can be exploited for a dollar, by 1997, is. Nothing is sacred, not even scouting or youth sports. Not beholden to anybody except the people of this state and the people of this country, The Idaho Observer has no intentions other than to provide the most intelligent, legitimate and credible possible sledge hammer to tear down the wall of corruption and greed which keeps good people and good science separated. 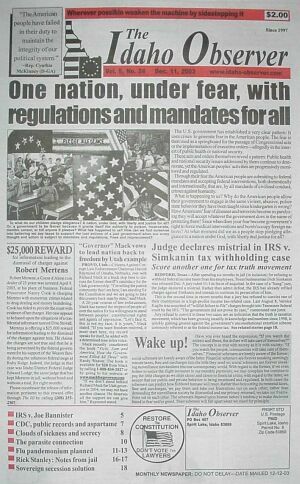 The editorial policy of this newspaper is to give favorable press to the good, concerned, active Americans who have done the research, have identified our problems and are spending their lives and life savings to find solutions and; to give favorable press to the gifted and intelligent scientists and engineers who have dedicated years of their lives to developing viable alternative technologies which will allow us to maintain the lifestyles we enjoy without compromising our earthly environment in the process. Ironically, the dominant media generally labels these people as extremists, right-wingers, conspiracy theorists-- or worse--and refuses to report on the viable alternative technologies which, once given to the public, would ruin the marketplace monopolies for a handful of extremely powerful corporations. The irony deepens as the dominant media, while demonizing the good people who love their country and have vowed to save her, refuses to report the unethical, illegal and immoral actions of the people who are really ruining this country with their greed and incessant abuses of authority. Regardless of who they are, or what position in they hold in the wall of corruption which keeps good people and good science divided, when we get the incontrovertable, documented evidence of their treachery, The Idaho Observer will also give those individuals the press they deserve. The Idaho Observer, is not for sale. It is not for rent and it has only one purpose: To help fight the battle for a peaceful return to the Constitutional Republic our Founding Fathers bought for us with their blood. Subscribe to it; write to it; investigate and submit documented reports to it; advertise in it and support it. The Constitution for the United States of America is all that stands between Americans and slavery; a truly free press is the only thing left in this country which is keeping our Constitution alive. To be notified when this site is updated send email to vaclib@startmail.com with SUBSCRIBE UPDATE in the Subject field.